"In Our Own Words: Native Impressions—That Language" by Daniel Heyman, Lucy Ganje et al. The project was funded by an arts and humanities grant from UND’s College of Arts and Sciences, with additional support from UND’s Department of Art and Design, the Myers Foundations, and a Summer Faculty Research Grant from Princeton University. Professor Emeritus Kim Fink is a master printer, who formerly taught printmaking and served as director of Sundog Multiples at the University of North Dakota. Professor Emerita Lucy Ganje is an award-winning graphic designer, who formerly taught graphic design at the University of North Dakota. 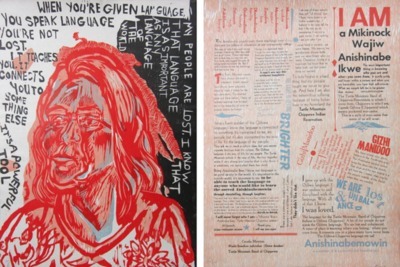 The pair of original prints is from the In Our Own Words: Native Impressionsportfolio. Focused on individuals from the Tribal Nations of North Dakota, this collaborative project was intended to chronicle lives of contemporary Native American people through a series of original artworks. Four North Dakota tribal colleges hosted visits from two UND art professors, Kim Fink and Lucy Ganje, as well as Philadelphia artist Daniel Heyman and Leigh Jeanotte, a member of the Turtle Mountain Band of Chippewa and Director of UND's American Indian Student Services. During these visits, they talked with twelve tribal members, while Heyman drew their portraits. Produced by Sundog Multiples at the University of North Dakota, the portfolio contains twelve reduction woodblock prints based on the portraits by Heyman, along with fourteen letterpress prints by Ganje that contain words taken from interviews with the sitters. The production of the prints was overseen by Fink.